Today, the vast majority of trucks rolling off assembly lines are outfitted with a computer that automates the shifting of gears, which is more efficient and quicker to learn at a time when haulers are eager to lower costs and desperate to find more drivers. Bryan Berg drives a semi with a 13-speed transmission, and he’s been double-clutching and shifting gears in his rig for 30 years. He’s not about to start driving a truck that shifts automatically. That’s changing. The strictly manual transmission is disappearing from the cabs of semitrailer trucks — and the strong economy is one reason why. In its place is a manual transmission with a computer that automates the shifting of gears. That’s different from the automatic transmission that’s common in cars and light trucks. Truckers tend to use the word automatic to describe newer gearboxes, however, and they have the same effect of freeing a driver from shifting gears. Today, the vast majority of trucks rolling off assembly lines are outfitted with the newfangled transmission, which is more efficient and quicker to learn at a time when haulers are eager to lower costs and desperate to find more drivers. “In the next three to five years, pretty much everything is going to be automatic,” said Gary Pressley, president of Heavy Metal Truck Training in Eagan, Minnesota. Regional and local trucking companies that use older trucks may hold on to manual transmissions for longer, but the days of a trucker gear-jamming down the interstate in a 36-speed are coming to an end. 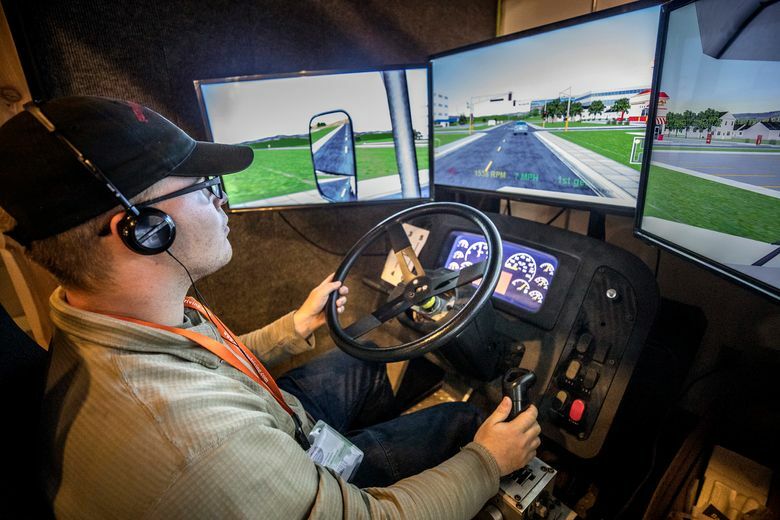 Over-the-road carriers face a long-running nationwide shortage of truck drivers, and the shift to automated transmissions is accelerating thanks to the ease of training new drivers to use them. Most new drivers didn’t grow up driving a stick shift. “Being able to get a driver and get them into a truck and trained and up and running as fast as possible becomes very valuable to a lot of companies,” said Wesley Slavin, on-highway marketing manager for Peterbilt, a division of Bellevue-based Paccar, that now produces nearly 90 percent of its trucks with an automated transmission. The computers controlling automated transmissions can “down-speed” — lower the revolutions per minute of the engine at high speed — effectively and are thus better at controlling gas consumption and emissions. While very experienced drivers can coax close to the same gas mileage from a manual transmission that a computer can get, new drivers cannot. Also, the technology has improved in recent years. Early versions of an automated transmission annoyed drivers. The computer would shift too late or too soon, and experienced drivers wanted nothing to do with being a passenger in a truck driven by a novice software program. “I drove one probably 10 years ago, and I didn’t like it,” said Ken Steinfest, an 81-year-old who still drives a semi with a 13-speed manual transmission, his white labradoodle in the cab with him. The new transmissions are now better integrated in the trucks and the computers have gotten more precise, evaluating engine torque, engine speed, vehicle speed and vehicle angle before shifting gears. “It just shifts and you don’t notice,” Slavin said. Brian Daniels, manager of Detroit Powertrain and component products for Daimler-Benz, which makes Freightliner trucks, said automated transmissions were a niche market six years ago. But better products came on the market around 2015 and demand for them rose quickly since. “There’s still the die-hards out there, but there’s some conversion happening of the die-hards, too,” Daniels said. About 85 percent of Freightliner’s semis now have automated transmissions, up from about 10 percent four years ago. Truckers in Europe adopted automated transmissions sooner than those in the U.S. Volvo, one of the handful of large truck manufacturers in North America, introduced its I-shift transmission in Europe in 2002, and by the late 2000s about 75 percent of trucks in Europe were fitted with an automated transmission. Reluctance in the U.S. has now fallen away. At Schneider Trucking in Green Bay, Wisconsin, all the new trucks they buy have automated transmissions. The kicker for driving instructors is increased safety, said Bill Collins, owner of Interstate Truck Driving School in South St. Paul, Minnesota. At a simulator at the school, one student practiced shifting gears on a 10-speed manual transmission. In a gravel lot out back, two students practiced backing up, another inspected the undercarriage of a truck using an orange pointer. Collins said there’s less for drivers to worry about when they don’t have to shift gears. But some companies still have manual transmissions because they don’t replace trucks as often as the big over-the-road carriers, so Collins still teaches students to drive a manual transmission. And not all drivers are persuaded that automatic is better. Abdullahi Abdulle, who was taking a break at a truck stop, said he doesn’t mind shifting gears. In fact, it helps keep him alert, he said. He’s been driving for three years and was waiting for a new load.